Having worked for both luxury hotels and a wide range of corporate businesses over the years it seems logical that we might somehow combine the two. I must admit I never saw how we could creatively exploit the link – until recently. My thinking has been that with a strong brand culture, most of the larger hotels in London logically focus their online presence on their customers. Then, invariably this sort of marketing-led creative work is handled centrally at a headquarters in, for instance, Milan or New York. But hotels are a business like any other and require a corporate side to their branding. The first requirement of this is usually the part that makes the hotel tick – staff resourcing. It’s this interesting crossover of corporate and luxury that recently led us into our first luxury hotel web design project – for the Bulgari Hotel in Knightsbridge. 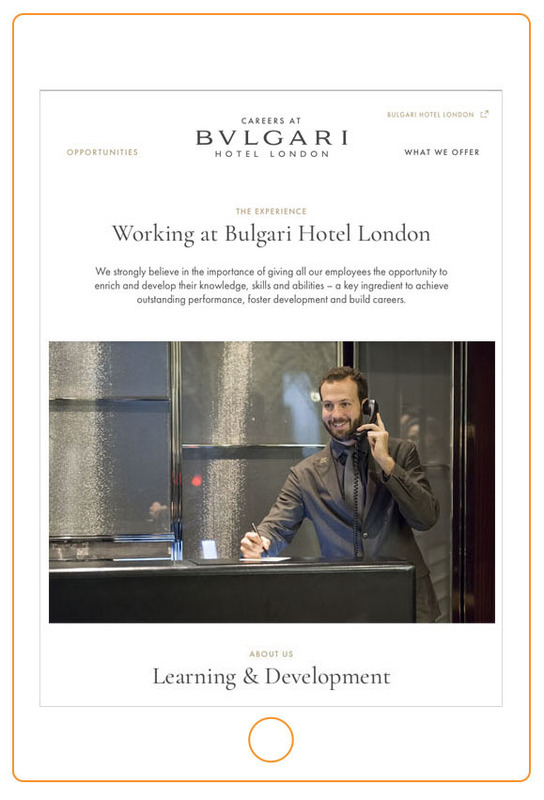 We were approached by the HR team at the Bulgari with a requirement for a dynamic, stand-alone website listing job opportunities at the hotel. 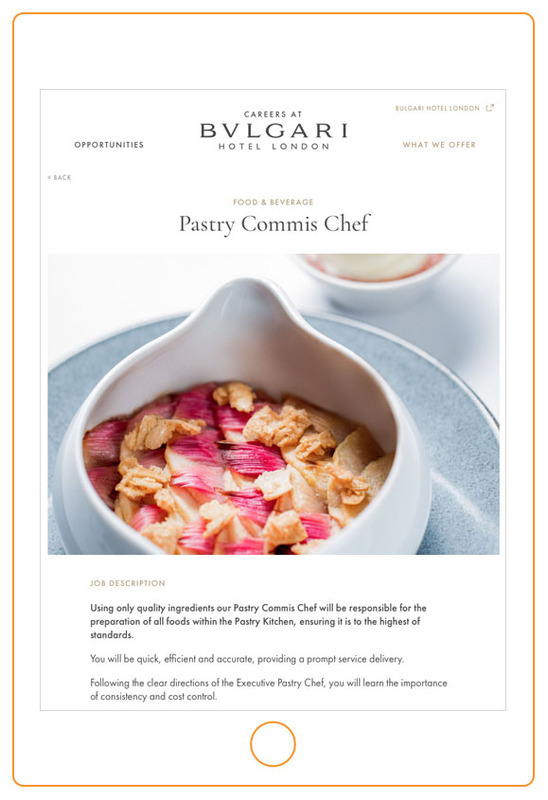 Central to this brief were two core elements – a presentation of the Bulgari brand and its values front and centre, as well as an ease of use for the HR team so the site can be regularly updated. The notion of a brand’s ‘values’ is one that is overused in the design world, but is fundamental to a site like this. It has to be presented clearly. Staff attitude could make the difference between a client having a good time or a negative experience. As we discussed with the Bulgari, the team are the living embodiment of their brand. So it’s incredibly important that this site showcases to new staff members what the hotel stands for and what that means for their professional presentation. Part of that was language but in a sense we were living and breathing Brand Bulgari ourselves in the creation of this project – and I think that shows. We’ve spent many years working in the travel and hospitality business. In fact I started my career many years ago designing holiday brochures, the travel experience and even in-resort signage for First Choice Holidays. Then around ten years ago I worked on the brand and website for Compass House, a boutique hotel in Bantry Bay, Cape Town. This was the first time I had worked on a hotel brand from the ground up. I’m pleased to say that design (and the gorgeous hotel) is still going very strong. Then last year we undertook a series of piece of work for Rosewood London, the Holborn-based outpost of the luxury hotel group. I have carefully documented our work for Rosewood but the highlight of that series of projects was the hand-made leather bound menu for Scarfes Bar, one of the world’s great cocktail bars. However the project for Bulgari marks the first time that we’ve worked on a digital project for a major luxury hotel here in London. So it’s a special moment and one we’re really profoundly proud of. It’s been an incredible opportunity. We’re really interested in expanding our work with hotel and hospitality brands, both here in the UK and abroad. Please get in touch if you’re interested in exacting, high-spec work like our project for the Bulgari London.